Almost every exterior panel on the Cadillac CTS-V super sedan is unique, from the fascias and fenders, to the hood, rear spoiler and rocker moldings – and every one was designed to support the car’s capability, contributing to lift reduction, enhanced cooling and improved aero performance. 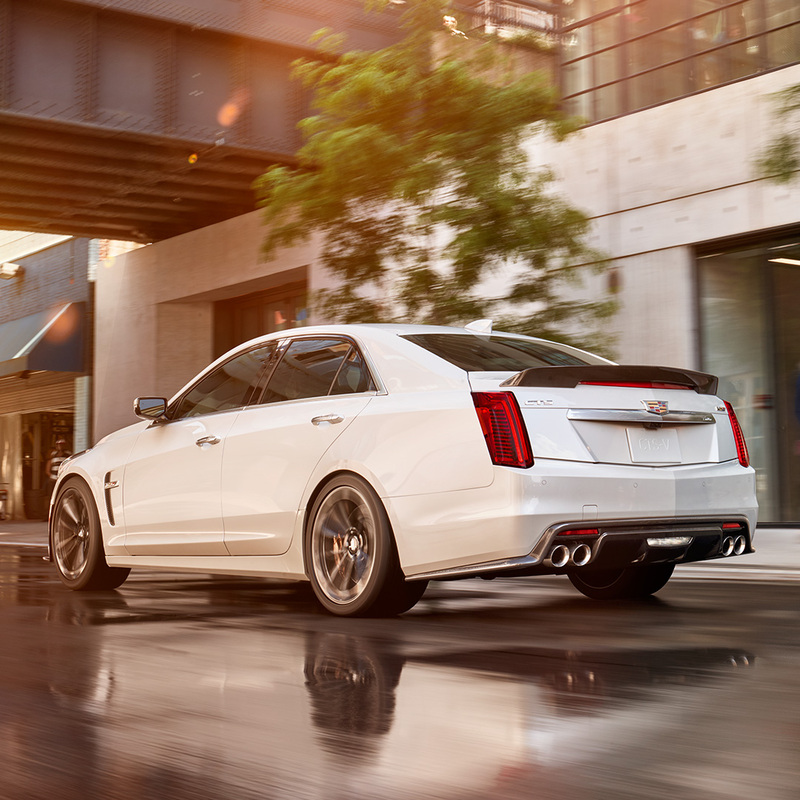 With its athletic stance, wide body and low height, the CTS-V’s shape is both aggressive and intelligent. A lightweight carbon fiber hood features an air-extracting vent that not only pulls hot air out of the engine compartment, but helps reduce lift at speed by channeling air pulled through the radiator out and over the top of car rather than allowing trapped air to exit under the car. Unique front and rear fascias provide optimal aero performance, with larger grille openings in the front fascia to feed more air to the supercharged engine. Even the mesh pattern of the signature grille openings is enlarged to allow more air into the radiator and multiple heat exchangers. A front splitter enhances handling by forcing air to push down on the front of the car rather than flow under it, where it can cause lift. Wider fenders to accommodate the wide, 19-inch wheels and Michelin Pilot Super Sport summer-only tires. The forged aluminum wheels and brake calipers are offered in three finishes, allowing owners to personalize the appearance of the Cadillac CTS-V.
An available, all-carbon fiber package takes aero performance and dramatic styling to higher levels. It includes a more aggressive front splitter, hood vent trim, rear diffuser and a taller, exposed-carbon fiber rear spoiler. The exposed carbon fiber components are book-matched on the centerline for a precise, tailored appearance. Colors offered for 2018 include Black Raven, Red Obsession Tintcoat, Phantom Gray Metallic, Crystal White Tricoat, Radiant Silver Metallic and all-new colors Satin Steel Metallic and Vector Blue Metallic. The 19-inch lightweight, forged aluminum wheels come in three finishes: premium painted, polished with Midnight Silver painted pockets and full, After Midnight premium painted. Available Red or Dark Gold Brembo brake calipers accent the super sedan’s performance capability with style.